What is the purpose of your seminar ? Congresses, conventions, product launches, training seminars, award a commercial challenge? 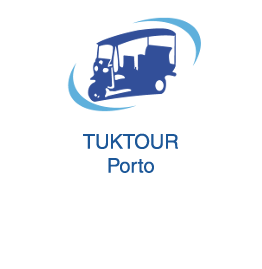 In small groups or a larger committee, TUKTOUR PORTO is at your disposal to build your ideal seminar. This program is developed with our partner ECOLOTOURS-TURISMO. What tone do you want to bring to your seminar ? We offer turnkey solutions to define together at the time of your booking. What fun activities do you plan for your clients ? According to a clear definition of your needs and budget, along with our knowledge of Porto, Vila Nova de Gaia and Matosinhos we will be able to offer you the host level and the organisation you wish to make your stay a perfect success, where work, entertainment, incentive, original animation, discovery of a great city, its food, its wonderful wines of Porto are on the program, with the conveyance of our electric Tuks. Unusual activities: various workshops, puzzles, treasure hunts, games. From your hotel, we will join a prestigious brand of port wine, where you will enjoy a precious vintage, that we have decanted a few hours earlier. Complete the evening with a surprise dinner in one of the best restaurants in Porto, delicious dishes accompanied by fine wines. Finally to finish, discover Porto by Night, an extravaganza of light, with our guide to discover the illuminated monuments of the historic center. Great evening in perspective …….. for your clients. TUKTOUR offers one or more Tuks with a guide, who will take your clients or seminar guests wherever you want, at your own pace and according to the route we predefine together. 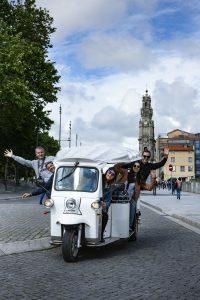 In a relaxed, friendly and fun atmosphere your guests will take with them unforgettable memories from Porto, Vila Nova de Gaia and Matosinhos. Do you want to show your collaborators, in a simple and practical way, the commitment of your company to the environment? With our electric tuks you convey a positive and unifying image to your customers and partners. Consult us. Festival, concert, show or cultural event in Porto, Vila Nova de Gaia or Matosinhos. If you are organizers, contact us for promotion or participation of our Tuks in your events.